Welcome back, sorry that I have missed a few, but we are back to reviewing comics every day! Today, Seppin is going to be reviewing Amazing Spider-Man #5 written by Nick Spencer and art by Ryan Ottley. So, we are back to Nick Spencer’s Amazing Spider-Man. I am not sure how I feel about the comic right now. I like the premise of the story and how it splits Peter Parker’s life right down the middle and lets us view all of his personalities. However, I think that it is almost a little underwhelming, or perhaps I was a little bored whilst reading this book. I am still very unsure about where I would score it. I know that it isn’t as good as Dan Slott’s run, but who could top that? However, I really am enjoying the life of Peter Parker without all of the crazy shenanigans. 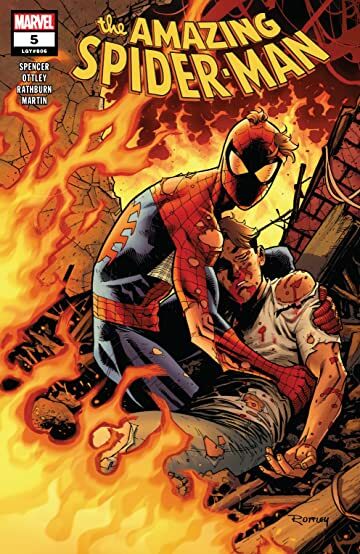 As for the story during this issue, it is basically about Peter trying to get Spider-Man and him back into the same body before they both die. It’s nice to see the two interact and I really love watching a Spider-Man without responsibility, but he seems a little too arrogant to like. Maybe that is intentional, but I don’t like it. We also get very little story for when it comes to the “bad guy”, Mendell Stromm, who seemed to last five seconds in this story. I am interested to see more of these villains Nick Spencer keeps hyping towards like Kraven the Hunter. Overall, I like the story, but I am not sure where I stand when it comes to ranking it. (But of course, I have to give it a score).